Among the Red Stars is one of those books that held my heart in the palm of its hand. Talk about a book that I needed to figure out the ending. I was warring between skipping to the end to put my heart out of its agony, and wanting to savor the story. There is no way that Among the Red Stars did not capture my heart. The characters in this story could have ripped my heart strings out. They were characters that felt tangible to the touch and they demanded my loyalty. 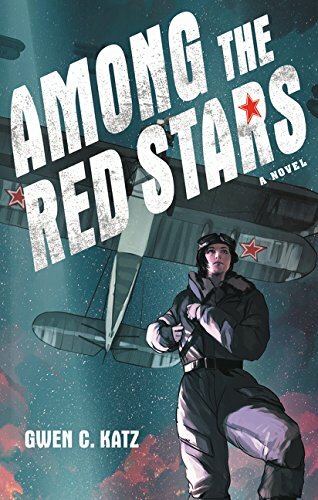 I’m a huge fan of historical fiction, so I was pretty sure I’d love Among the Red Stars, but I wasn’t prepared for how much. It is a book that will move you, whether with its portrayal of war, the romance, or these girls that deal with adversity, challenges, and prejudice. I adored Valka and her spirit from the very line of dialogue she had. Valka is passionate, brave, spirited, and determined. She’s like a bright burning spark. I want to get into trouble with her and have her beside me laughing. Whereas when I first met Pasha I wanted to protect him from everything in this world. And don’t get me started on the little things I adored about all the other side characters. Part of what kept me reading was that I had to know what was going to happen to Valka and Pasha. They bewitched me and I had to keep reading to know if they would survive, unscathed, forever changed, or not. And as someone who relishes sleep, that’s a big compliment. But it’s part of the strength of Among the Red Stars that it just takes over your heart so completely. Historical fiction, historically has been one of my favorite genres. Yes I had to make that awful pun. I’m sorry. But I think that Among the Red Stars is such a unique and compelling story. Not only is it based on a true story, but Katz does not paint us a one sided black and white portrait of history. There are ‘traitors’ and betrayals, tests and prejudice. Whether it be the seasoned female soldiers who had to fight tooth and nail to be in the army worried about these new girls, or the fact that these girls don’t want to be “good for girls”. Or how these character’s lives are touched, in various ways, by a society that arrests civilians for being in the wrong place at the wrong time or telling the truth. Among the Red Stars is a thoughtful portrayal of a charged moment in time. It’s a book where you can feel the fire on its wings, the tension in your bones, and the fear in your veins. But at the same time it’s a story about friendship, taking chances, and disobeying orders because they’re wrong. It’s a story about leaving our home and coming back a completely new person. Growing into new experiences, fears, and strengths. And above all, it’s a story of these heroic women who fought against the odds in the air and on the ground. Find Among the Red Stars on Goodreads, Amazon, Indiebound & The Book Depository. Have you ever flown on a plane? What’s been some of your best experiences? This book sounds like the perfect historical fiction read. I love the setting, and the characters sound amazing as well as the struggles they endure. Excellent review! This is one of those novels that makes me stop and think ‘what would I have done?’.